Legends of Tomorrow news for the morning includes news on a pilot director and a photo from the Legends Episode 2 table read. 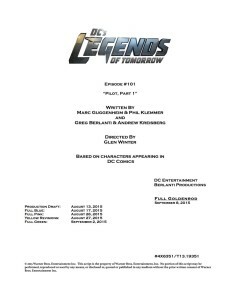 Some cool stuff this morning from DC’s Legends of Tomorrow Executive Producer Marc Guggenheim. First, there’s a table read photo for Episode 2 of the series, where you can spot the show’s talented cast all around a table prepping for what is sure to be awesomeness. You can see that up above. Also interesting is that it’s listed as “Pilot, Part 1,” which implies to us either the first episode will spread over two weeks (or two nights, following Flash and Arrow, maybe?) or it will be a two-hour premiere all on one night. We’ll have to see where that one goes. every actor in this series was fantastic thanks for your arcipitation i mloved every minute .